Very cool indeed, and I may have to check out that website for Christmas gifts. 1) Would it be in your rules to do your toes? I would think it would be easier since you could use your dominant hand on both feet. 2) Speaking of that, which is your dominant hand and do you think you've become better at paiting those nails through this? Just some things I know I would be going through. That is so cool, I want to try that next Halloween! Shawna Fay- Totally check out that threadless link, they are having a sale right now- $12 tees with free shipping! :) Answer to #1- nope, I don't do toes a) I have horrible feet -to the extent that I have had surgery on them, they're not like, gnarled or anything, but I tend to hide them more than show them off. :-P b) all of my toenails are minute- almost like baby fingernails, with the exception of the big toe, so I couldn't paint anything cool! Luminous- thanks for the link! it looks wicked! literally! that is sooo cool! This one is ultra cool. Spooky! Awesome! !, it looks so cool, excellent job done. 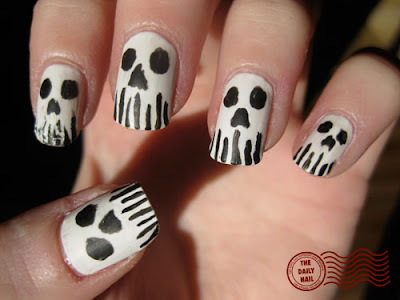 these skull nails don't look so well, I suggest a socond try, you are talented but maybe you work so fast.